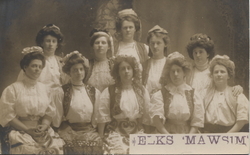 Among the many fun and fabulous postcards currently on view in the reading room of the Van Gorden-Williams Library & Archives are a handful that are related to the Elks. The Elks trace their roots back to New York City in 1867. The group was first known as the "Jolly Corks" and they were essentially a group of merrymakers whose members consisted of New York City entertainers. Charles Algernon Sidney Vivian became the official leader of the group, and on February 16, 1868, the group resolved to become a benevolent order and to change their name to the one they still carry today - the Benevolent and Protective Order of Elks, frequently abbreviated as B.P.O.E. The postcards seen here (which are also on view in the reading room) were all produced in 1906 and 1907. In July 1907, the Elks had 254,532 members, and while this was in the heyday of American fraternalism (often called the "Golden Age of Fraternalism") it was still a far cry from the eventual number of members they would have - by 1950 there were approximately 1 million Elks, and by 1979 membership was at 1.6 million. Today the Elks' membership is just under 1 million. The postcard from the 1907 convention, while not as colorful, reveals just how big these events were. This real photo postcard shows the illuminated "Court of Honor" for the convention held in Philadelphia in 1907. In its name, its illumination and its scale, the Court of Honor resembles the illuminated "Court of Honor" at Chicago's 1893 World's Columbian Exposition. A New York Times article reporting on the opening of the Elks' 1907 convention gushed "Elks by the thousand poured into Philadelphia to-day and to-night. They came with their wives, sweethearts, and friends from every section of the country, and the greeting of welcome they received took away their breath." A few days later, on a decidedly different note, the Times reported that the "Sun Fells 2,500 At Elks' Parade," reporting that many parade watchers suffered from over-exposure to 90 degree temperatures and "excessive" humidity. It's clear that businesses were ready to tailor their advertisements toward Elks that visited their city for annual conventions. In Philadelphia, the S. Abeles & Co. produced this wonderful mixed-media postcard that uses fur cut out in the shape of an elk to advertise the "best line of trimmed hats." And, finally, this last postcard, copyrighted 1906 in Chicago, is likely not related to a particular annual convention, but it's another Elks postcard in the exhibition and it's just too fun to leave out. The card depicts a young woman holding an egg - presumably the subject of the question "Is It Good Or Bad?" - and stands beside three elements that identify this as being part of Elkdom: the mounted Elk head, the clock reading 11 o'clock, and the letters B.P.O.E. The sender of the postcard has written a brief message on the card, which seems to keep with the playful, flirtatious nature of the card itself: "I'm an Elk, what are you?" A Penny for Your Thoughts: Postcards from the Golden Age, 1898-1918 in on view in the Van Gorden-Williams Library & Archives reading room through September 2009. Also, be sure to check out our Send a Postcard feature on our website, where we've made it possible to send electronic versions of penny postcards - for less than a penny.